Back in November, a friend of mine (and fellow twihard) and I decided to throw a girls night out around the movie release of Twilight’s Breaking Dawn 2. We were initally going to have it in her home but being so close to the craziness of the holidays, we decided it was best to have it at a local restuarant. 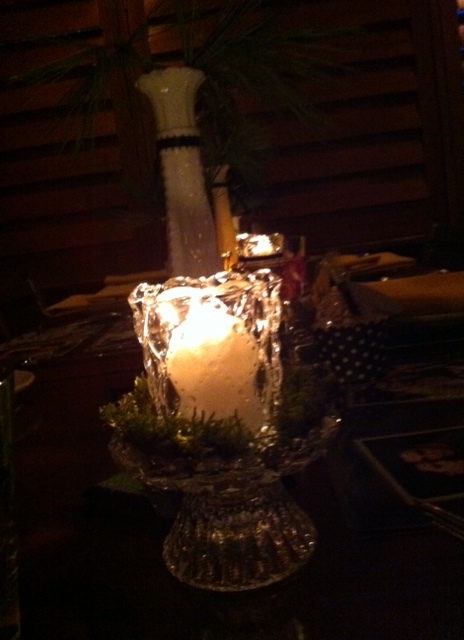 Having it out solved the food/drink details, and allowed us to focus on the fun decor elements! We agree the red/black theme has been done and would be expected, so we wanted to pull on the movie’s setting. Forks is cloudy, misty, woodsy, earthy, and snowy and the movie’s hidden theme was sort of good vs. evil (although techinically they are all vampires/wolves)..so we wanted to bring in the black/white element as well to reflect that. 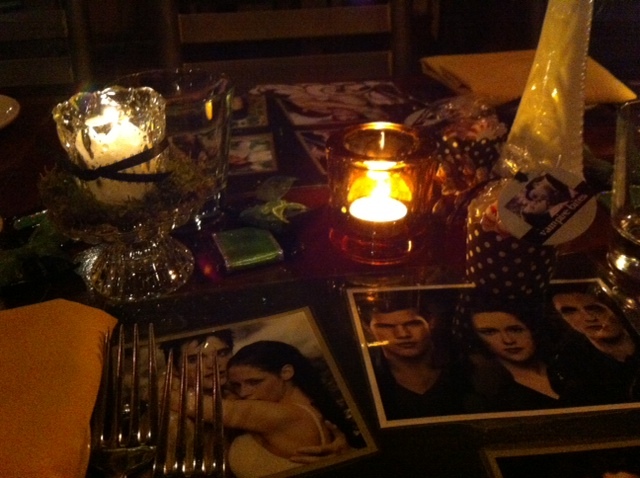 We used lots of moss, evergreens branches, candles and of course the fabulous placemats my friend made with all the movie photos! Favors were midnight dark chocolates and “vampire bites” (a.k.a. after dinner pepermints) the white with streak of the red were perfect. We had a great time with some movie trivia while we ate, and enjoyed watching the movie after dinner! Hope this is some inspiration for hosting a girls night IN with the release of the DVD this weekend!